LOCALS ONLY: CELL-2-SCREEN COMPETITION SCREENING – FREE ADMISSION! 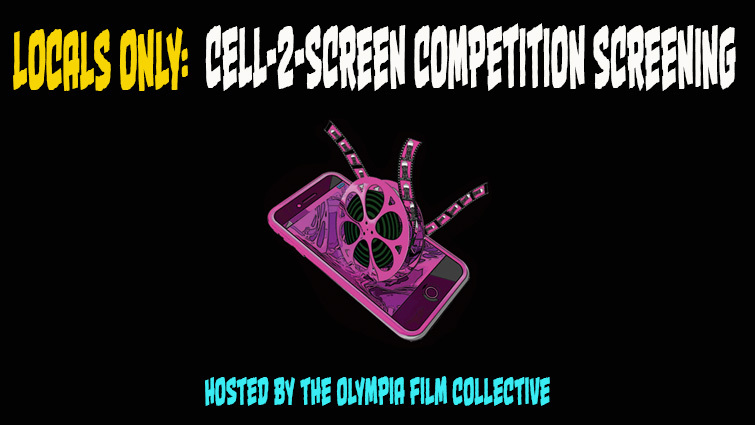 Co-presented by The Olympia Film Society and The Olympia Film Collective, the Locals Only Cell-2-Screen Competition is your chance to watch local filmmakers show off their skills in two-minute short films shot on their phones. Spanning genres from comedy to drama, and everything in between, this entertaining showcase will leave you in awe of what can be accomplished with a little technology and a burst of talent. And best yet, the audience gets to vote on their favorites, awarding the winning filmmakers with amazing prizes! Imagine you could be the first to spot the future of film…shot on cell phones. The 33rd Olympia Film Festival could be ground zero for the next cinematic sensation like, “Tangerine” (which was shot entirely on an iPhone). And if nothing else this super special screening will be a rare occasion where it is all right for a cell phone to be used in a movie theater!